Known for playing Mr. Sulu on the classic TV series Star Trek, visited the Kennedy Space Center to talk with workers about the value of diversity in team efforts.Takei, who is openly gay, said that Star Trek demonstrated the value of diversity. "We had visual diversity - an African woman, an Asian man, a pointy-eared alien. But you also heard the diversity - the Scottish accent of the engineer, the Russian accent of our navigator, the southern drawl of our doctor," he said, according to Florida Today. "The point we were trying to make is that there are diversities that you can hear. But another layer of that diversity that you can’t see or hear is sexual orientation. And sexual orientation can contribute to the strength of whatever enterprise you are engaged in. "While at the KSC, Takei got a close look at components being readied for launch to the International Space Station, NASA’s twin shuttle launch pads, and technicians working on a winged orbiter in its processing hangar. "I’m an actor. We just created the illusion of space," Takei said. "But here, the real thing is being done. What I see being done here is really the launching pad of the future. 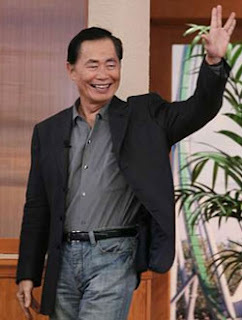 "Takei appears periodically on "The Howard Stern Show" and is cast in the NBC TV show "Heroes."